Posted on December 5, 2018 at 1:37 pm. Goat meat has never gone out of style, and demand for it only continues to increase, Oregon Meat Goat Producers President Stacey Rumgay says. Rumgay’s meat goat operation began as an effort to provide project animals for her Tops 4-H Livestock group in Clackamas County, Ore. 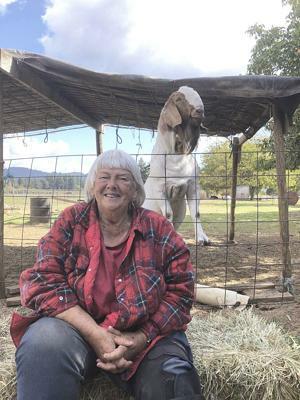 In 15 years, she went from a single Boer goat to 100 and this year kidded 140 babies at Western Horizon Ranch, where the goats now outnumber the cattle. Though prices ebb and flow, on-the-hoof goats fetch $1.75-$2.00 per pound. A good breeding animal commands $500-2,000 and, depending on age and quality, a market goat ranges from $200 to $2,000. Ruth Kilgore, the OMGP vice president, also got her start leading 4-H members. Now the Bacon Bits & Friends 4-H Club leader is a partner in Kil-Mar Acres, an 80-head commercial meat goat operation near Newberg, Ore., where, as in Rumgay’s case, ethnic groups are the backbone of her business. The U.S. accounted for 66 percent of Australia’s goat meat exports in 2017, a total of nearly 21,000 tons, according to the Global Trade Atlas. “We have all the cattle; it’s been our primary source of protein and what we’re used to,” Rumgay said. The few ethnic stores and restaurants that offer goat meat import most of it because they are unable to find a constant domestic supply. “I was contacted by a restaurant that wanted 6-8 goats a month; I couldn’t guarantee that,” Kilgore said. Goats are multi-purpose animals, providing milk, meat, hair, 4-H projects — and unique brush-cutting services. “Goats are superior, environmentally friendly brush eaters who can eradicate a blackberry problem in three years,” Kilgore said. “They get along with other animals, picking out weeds like tansy ragwort and poison oak, leaving the pasture for cows and horses. Rumgay echoes her enthusiasm and hopes consumers will start asking for it and bridge the “disconnect” between growers and grocers. “Goat is the only red meat low in cholesterol and if you cook a roast just right it’s the texture of a turkey leg — just delicious,” she said. “They’re great for our youth to show and learn about agriculture and excellent at converting weeds, blackberries and brush into high quality meat.